John Byrne is a Scottish playwright and artist. As well as designing Penguin covers and sets for his own plays, Byrne has designed record covers for the likes of the Beatles, Billy Connolly and Gerry Rafferty. Many of Byrne’s paintings hang in the Scottish Portrait Gallery, whilst other works of his can be found in major collections elsewhere in Scotland and abroad. 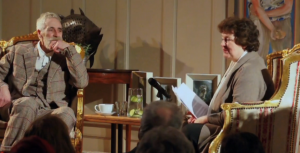 In this video, Byrne is in conversation with theatre critic Joyce McMillan, in the Main Hall at Summerhall.